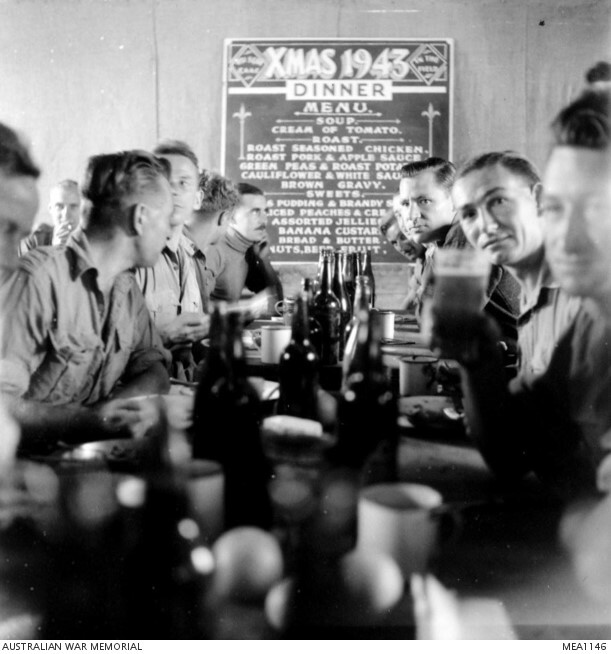 For the past century, many Australian servicemen and woman have had to celebrate Christmas away from their families and home in foreign lands. Through images and memories, this article details some of the Christmas experiences that soldiers have had. In the first year of the Great War, many Australians of the newly formed Australian Imperial Forces were stationed in Cairo, Egypt waiting to be deployed in battle and thus had a very unique Christmas spending time bartering in marketplaces with the locals and generally having a good time. From home they received packages from home that contained items such as tinned pudding, biscuits and cakes. 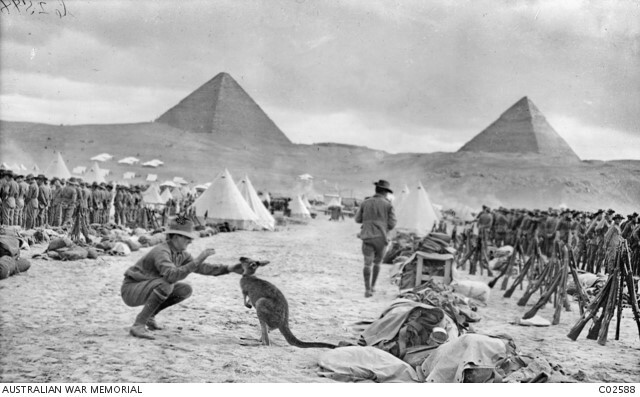 Lines of the Australian 9th and 10th Battalions at Mena Camp, looking towards the Pyramids. AWM CO2588. 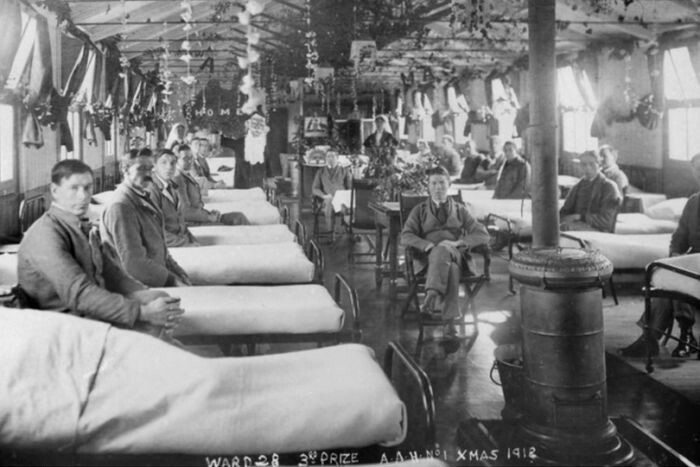 Later years in the war were far different experiences for Australian soldiers with many having no choice but to spend the holiday in the trenches or at military hospitals not far away. During World War Two, Australian servicemen and women once again left the comfort of home to fight the enemy across the globe. 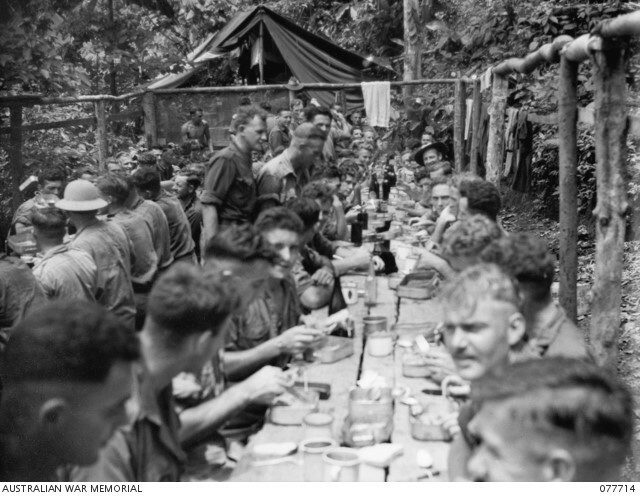 Many Australian soldiers also received food and gift packages from home and used Christmas as a brief time where they could relax and have fun. Left: El Daba, Egypt. 25 December 1943. Members of No. 451 (Spitfire) Squadron, RAAF, sit down to Christmas dinner. AWM MEA1146. Right: Bougainville Island. 1944-12-25. 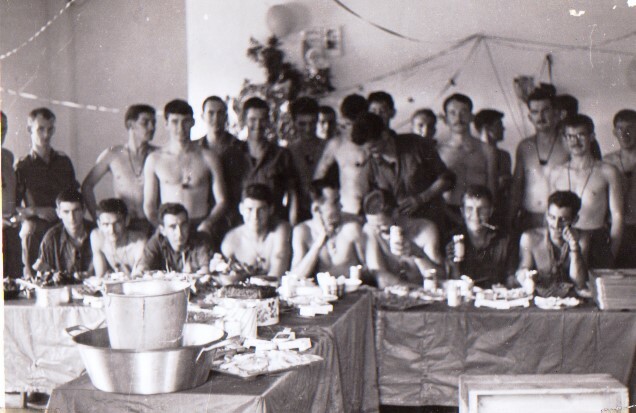 Troops of the 9th infantry battalion enjoying Christmas dinner. AWM 077714. In the Korean War, Australian forces were a part of the larger United Nations forces fighting against the forces of the North. Australian servicemen and woman had to deal with the freezing temperatures of the Korean Peninsula while they celebrated the Christmas season. Korea. 1 January 1953. 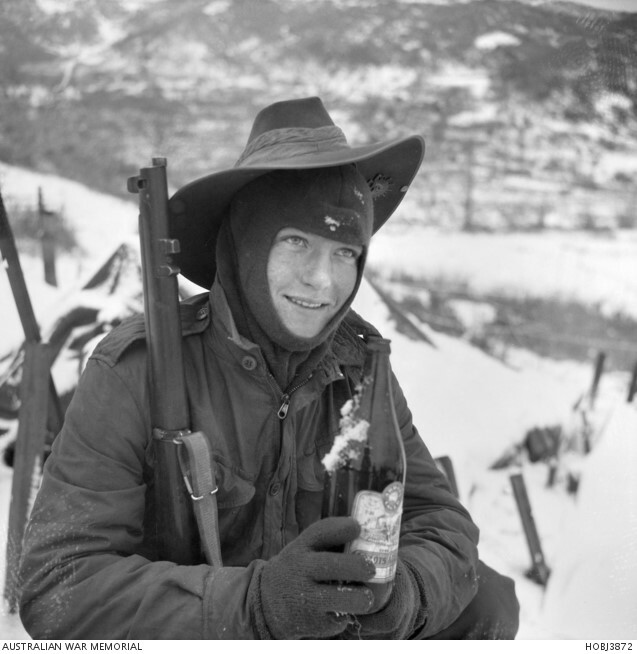 28290 Private Lawrence Charles (Larry) Hopson of Turramurra, NSW, and of D Company, the 3rd Battalion, The Royal Australian Regiment (3RAR), enjoys a bottle of beer from a Christmas parcel, despite the fact it is half frozen. In the Vietnam war thousands of Australians once again left their homes, this time to fight in the tropical land of Vietnam. But it was now Christmas, Binh Ba-style. First came a stirring message from Task Force Commander Brigadier Jackson. He sent us best wishes for Christmas and the New Year, 1967. In our seven months of action we have come a long way together. Much has been achieved, but we all know there is much to be done. I know well that on many occasions a great deal has been asked of you, and always without fail you have responded in the true tradition of the Australian soldier. I am deeply proud of your achievements and you have every cause to share in that pride. During this time of celebration and thanksgiving we will all be pausing in our rare quieter moments to think of our families and friends at home, the events of the past few months, our fellow soldiers who are no longer here, and the future. Many thoughts and prayers will be with each of you, and from them we can all draw strength and determination for re-dedication to our tasks her in Vietnam. We need to have no fears for the future. It is now clear that Communist aggression against the people of South Vietnam will fail. We cut down a lemon tree in the backyard of the Binh Ba villa and decorated it with toilet paper, string, barbed wire and bits of silver from cigarette packets. Blue and Bernie organised their sections to hang ration cans on the tree as ornaments, and I took my men out to scrounge for fruit and for spare hootchies to use as tablecloths – anything that would take our minds off war. As one of those more touching gestures, most men found something to give their mates: a pocket knife, a torch, playing cards – anything that didn’t resemble Army issue. John Lea-Smith and Mick Deak drove into Ngai Giao and procured cartons of American beer. Each small thought and action had a huge impact on all of us: Christmas was a small piece of normality in a place that was everything but normal. Deak later spoke quietly to us about Reconnaissance Platoon being a family. Those words, from someone as tough as a grunt’s boot, had a further soothing and cheering effect on men who were close to running on empty. Haran and Kearney (2001), Crossfire, pp. 118-119. Reconnaissance Unit at Binh Ba, Christmas 1966. Private Collection. The more recent wars in Afghanistan and Iraq have also forced Australian Servicemen and Women to spend Christmas away from their families but this has not stopped them getting together for a bit of fun! Throughout the history of Australia’s military involvements, we can see that scenes of servicemen and women getting together to celebrate the traditions of the holidays is a constant feature. These traditions have helped soldiers deal with being away from their families it difficult times. 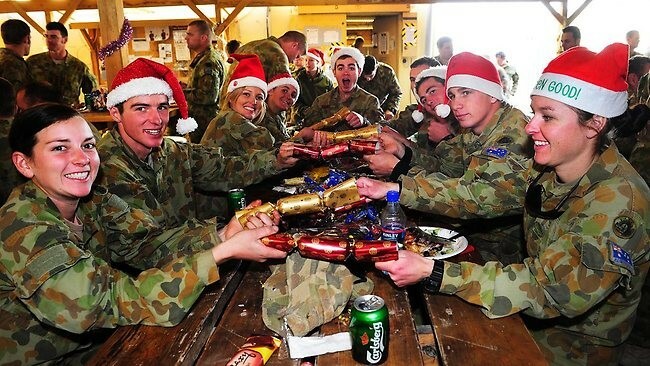 Australian soldiers from Mentoring Task Force Three (MTF3) enjoy time out for Christmas lunch at Tarin Kot, Afghanistan, 2011. Picture: Corporal Raymond Vance / Defence Dept published by news.com.au 28 October 2012. Merry Christmas from the RSL Virtual War Memorial!